In last week’s post on retro-fitted dumpster-pools, Mike Brady rightly pointed out that equal accessibility and social justice are essential components of meaningful sustainability initiatives. This weekend, Inhabitat reported on a new homeless shelter in Dallas which seems to have put these principles to work successfully. 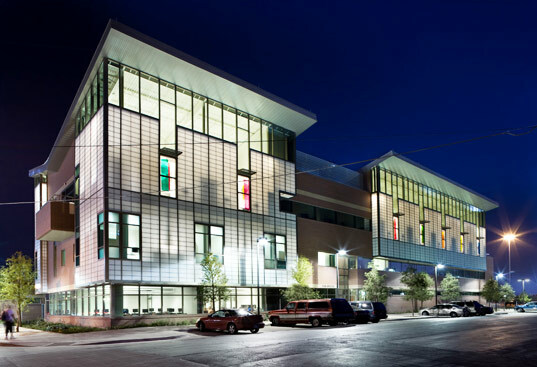 The building looks amazing, targets a LEED silver rating and, on top of all that, serves some of the most vulnerable urban populations. So much of the green design that we see here at Inhabitat is efficient and looks cool in renderings, but the human aspect of sustainability, and the real value of our built environment is too often a rarity. 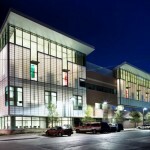 Not so in the case of this modern homeless shelter in Dallas, which recently won the AIA’s National 2009 Housing Award. Called The Bridge, the sleek shelter was designed by Overland Partners Architects in collaboration with CamargoCopeland Architects, and provides not only a visually striking addition to the neighborhood, but a safe haven for people to turn to when they have nowhere else to go. According to the press release, the shelter’s surrounding area has seen a crime reduction of 18%, which in itself is a testament to the power that design can wield when it is executed with a vision of bettering lives.